Ikon Concrete Design is a family operated company. The business of concrete construction has been passed down generation to generation. We take great pride and respect for our performance in decorative concrete concepts. Due to the technology of the concrete industry our employees are trained by the manufactures so that we may provide you with the best service possible. Ikon Concrete Design is able to provide a wide variety of hardscape construction in commercial or residential. 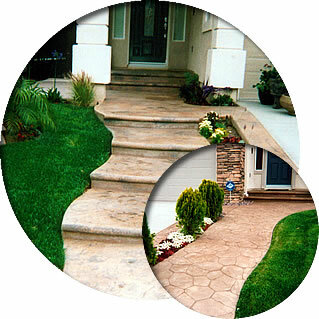 We offer stamping or texturing for concrete as well as overlay systems. We will provide you with a multitude of color schemes and stamp patterns, to fit any project, driveways, patios, pool decks, and more. We also can provide performance in interior surfaces with overlay stamping or texturing, acid stain, and sealers. We can provide you with numerous wall systems in concrete, block, or stone with detail caps for sitting, lighting or natural. Our reputation is unsurpassed in providing personal, quality service to our customers. Our commitment to detail and expert craftsmanship as well as being focused on neatness and good positive attitude from our staff awards us with repeat business and referrals.